HostingIdol Review 2019: Is HostingIdol a Good Hosting? Bulgarian company HostingIdol isn’t just a hosting company; it’s a leading web solutions provider that offers shared web hosting, managed VPS, virtual servers, and dedicated Linux container servers along with domain services and SSL certificates. HostingIdol started its journey in 2010. Today, it’s based in Sofia (Bulgaria) and offers a wide range of web hosting solutions including shared hosting, virtual and dedicated servers, domain registration and transfer, and SSL certificates. HostingIdol has 980 happy customers (at the time of writing), and to date has registered 670 domains, sold 250 virtual private servers, and sold 275 dedicated servers. This provider’s website is in English. HostingIdol offers three shared web hosting plans, three managed KVM virtual server plans (with server locations in the U.S., Asia, and Europe), four VPS server plans, and three dedicated server plans. All plans are PHP7 and PERL-ready, and you get a DNS Zone Editor for easy configuration of your domain’s DNS records. A free Cloudflare CDN is also included, to ensure fast delivery of your content to consumers. The company also offers R1Soft incremental backups (at an additional cost for shared hosting), and one-click WordPress installation. SSD storage ensures super-fast data read/write speeds, and a RAID-1 array ensures that your data is relatively safe in the event of a disaster. You get 99.9% guaranteed uptime, which is a little less than the industry average. 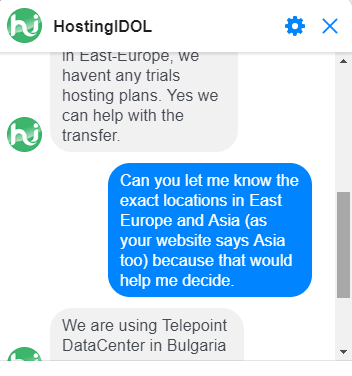 HostingIdol’s shared hosting plans are cheap, but they must be bought on an annual billing cycle. This wouldn’t be so bad if you had a get-out clause or some way to try before you buy, but this vendor offers no money-back guarantee and no free trial. Plans can be paid for in euros, U.S. dollars, or Bulgarian lev. HostingIdol’s self-support resources consist of a not-recently-updated blog, a not-much-use knowledge base, and just a few questions in an FAQ. onClick="trackClickout('event', 'clickout', 'Vendor Page - Visit User Reviews', 'HostingIdol', this, true);"
Hostingidol's develops help a lot with many web site loading optimizations, I saved money for bigger servers and my site are loading like a rocket now ! The team is awesome and is ready to help my very fast and anytime !Hightly recommend Hostingidol!! If you are looking for high quality hosting at a low price, backed by a human element, you could take a look at HostingIdol. Wondering how HostingIdol stacks up against other Web Hosting companies? Enter any other Web Hosting company and we will give you a side-by-side comparison.